FREMONT, Calif.--(BUSINESS WIRE)--Terafina Inc. today announced that KeyPoint Credit Union, one of Silicon Valley’s largest credit unions, with more than $1.3 billion in assets and 63,000 members, has gone live with Terafina’s digital omni-sales platform to create an engaging and personalized member experience across all of its channels - digital, call center, and branch. As evidenced in its forthcoming Celent report, “omnichannel retail delivery is nearly statistically tied with mobile channel development as the overwhelming #1 technology priority among surveyed banks and credit unions. You’d never suspect that from a Google Trends search.” This shows that competitive financial institutions must take into account all forms of interaction and engagement with their clients. KeyPoint, with a tech-savvy member community has always been a leader in adopting innovative technology and services that enrich the member experience and foster greater trust. With this newest investment, KeyPoint is enabling members to acquire the right products and services from KeyPoint that best fit their needs in one seamless and convenient experience that spans the member’s choice of channels. “We have a deep desire to continue to offer our members modern and humanized digital solutions that are uniquely personalized and provide a hassle-free experience. Moreover, we have an unwavering commitment to provide relevant product offerings that speak to the diverse and targeted needs of our members' life journeys. This new investment in Terafina is another example of our strategy to continuously invest in technologies and processes tailored to address members' unique evolving needs. 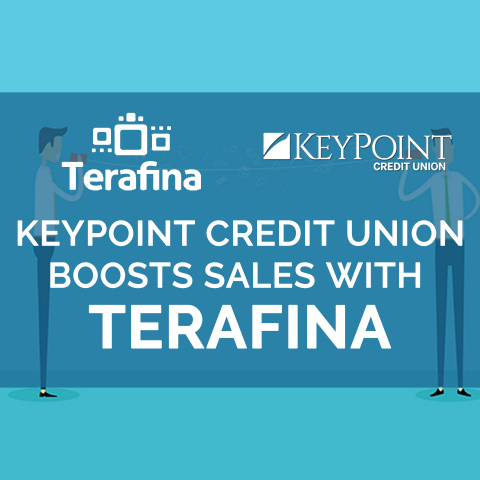 Terafina’s Digital Sales Platform delivers a modern digital experience to our members and equips KeyPoint with the capability needed to deepen member relationships,” said Anthony Vitale, CIO of KeyPoint Credit Union. Terafina's market-leading digital sales platform helps KeyPoint connect the member experience across multiple channels and create streamlined, scalable processes. From addressing onboarding issues with starting, stopping and restarting an application to proactively offering essential real-time data, call centers and branches can quickly offer targeted solutions to clients. Terafina is helping position KeyPoint for a very bright 2019 and beyond. Founded in 1979, KeyPoint Credit Union ranks among the largest credit unions in California with more than $1.3 billion in assets and more than 63,000 members. Born from Silicon Valley innovation and built to serve a diverse membership, KeyPoint is a full-service, not-for-profit credit union dedicated to providing targeted financial solutions and volunteering initiatives to foster a member community that thrives together. At its core, KeyPoint helps members make the most of their money –– earning more interest on savings, and paying less interest for credit. Terafina (www.terafinainc.com) provides omnichannel digital sales solutions to the banking and credit union markets. Terafina is based in Fremont, CA.